This summer picnic is sponsored by Mom it Forward and Refresh by Turning Leaf. All opinions are my own. 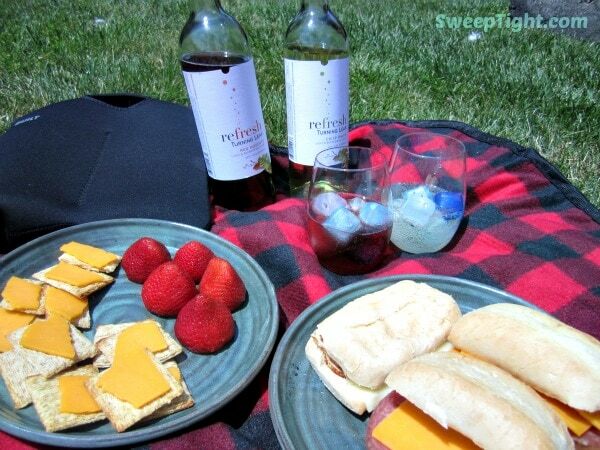 Who doesn’t love a nice summer picnic paired with a tasty bottle of wine or two? However, in this heat, all wine is best over ice. 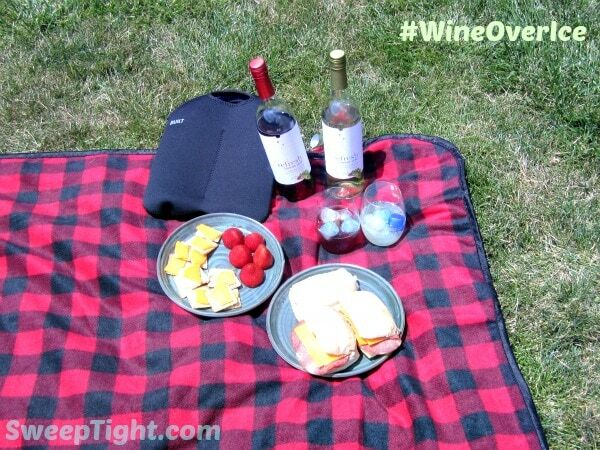 I used the exciting #WineOverIce prize pack to create a surprise afternoon picnic for myself and hubby. The contents of the box included everything you need for a perfect summer picnic except the food. 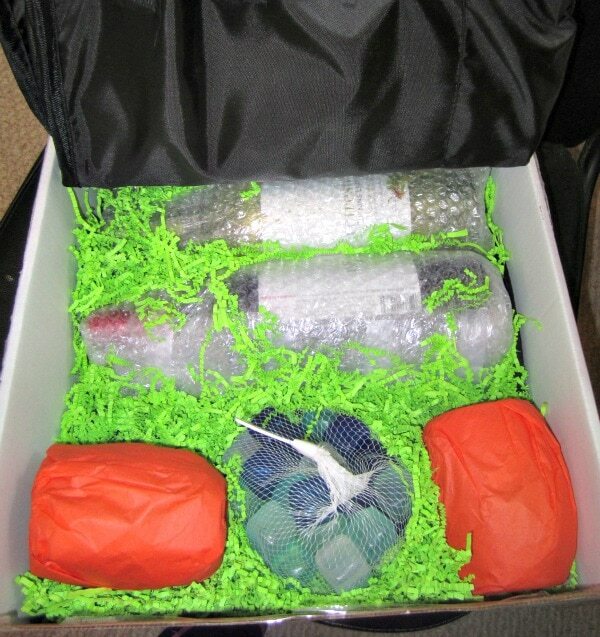 Two bottles of Refresh by Turning Leaf wines, two plastic wine glasses, an insulated wine carrier, reusable ice cubes, and a roll-up travel picnic blanket were included in this fun kit. I have always preferred to drink wine over ice, but in this heat, it’s a must. I cannot even imagine drinking room temperature wine when it’s 95 degrees out. 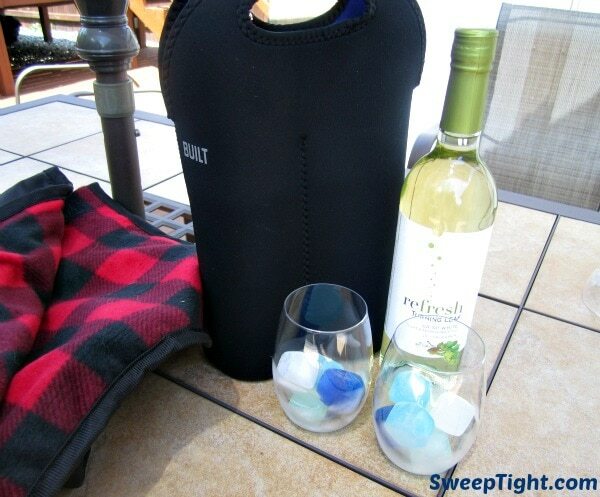 The plastic, reusable ice cubes worked out perfectly because they chill the wine without melting and watering it down. We received a red and a white wine to try out. Refresh is the perfect name for these type of wines, because they are, in fact, so refreshing. There’s a slight fizz to them, making them lighter and more crisp than still wines. The Crisp White has a citrus-y, apple flavor that is delicious and a great summer alternative to beer or a cocktail. The Red Moscato is a bit bolder with floral notes and sweet, fruity flavors. It also has the slight fizz that makes for a thirst-quenching treat in the heat. Other flavor options include, Moscato and Pink Moscato. Find more info on their Facebook Page. Mike and I were both pleasantly surprised with these wines. They are flavorful, yet light enough to make a delicious summer beverage. The twist-top makes them easy to bring along to any party or picnic. And… the $8 price tag makes them affordable, which is an extra bonus. Talk about adventures and food fun, have you checked out Adventure Yum yet? My BBF (Best Bloggy Friend), Dawn, has created an exciting new blog where she shares her adventures both in travels, and in the kitchen. When she’s not out exploring and experiencing exciting new activities with her family, she’s whipping up something scrumptious in her kitchen. I want to “Refresh it Forward” and send her a prize pack. I know she will put it to good use and probably blow my picnic out of the water! 😉 Cheers to one of my greatest friends and colleagues. I forgot how fun a good picnic can be. Take an hour during a summer afternoon to sit outside eating lunch. Grab a friend, partner, or family member. No need to travel far, just toss a blanket in your yard or a local park to soak up the sun and fresh air for a bit. Do you prefer wine over ice? Which flavor do you think you’d like best? Oh how WONDERFUL of you.. and super sweet.. and seriously awesome.. oh yeah and AMAZING!!!! I am more than flattered to be the recipient of this fabulous treat… it will surely be put to great use! I can’t wait to try that white wine.. my mouth is watering, it sounds heavenly! And.. my hubs will have no problem downing a glass or five of the red! We would enjoy it during a backyard BBQ. It’s great for a picnic. We would enjoy it when we have friends over to grill out. I’d enjoy my anniversary with is. 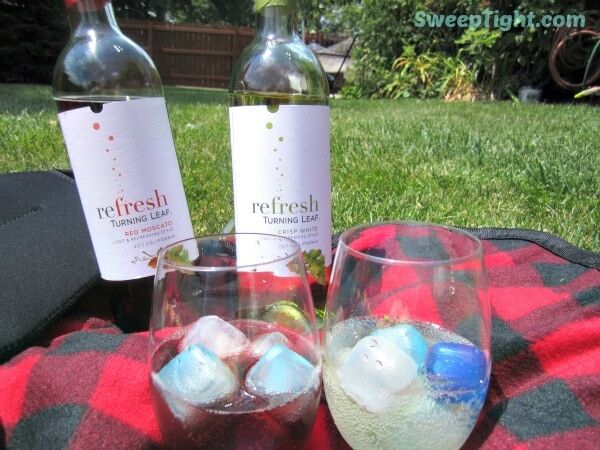 I’d love to enjoy a bottle of Turning Leaf Refresh Moscato at our next family BBQ. Sounds like it would go great with burgers on the grill! Monday night Jazz in the park with my husband! An evening BBQ with my husband. A couples game night of cards.